This image taken by the ultraviolet-light monitoring camera on the European Space Agency’s (ESA’s) XMM-Newton telescope shows the beautiful spiral arms of the galaxy NGC1365. Copious high-energy X-ray emission is emitted by the host galaxy, and by many background sources. The large regions observed by previous satellites contain so much of this background emission that the radiation from the central black hole is mixed and diluted into it. NuSTAR, NASA’s newest X-ray observatory, is able to isolate the emission from the black hole, allowing a far more precise analysis of its properties. In a galaxy, 600 million light-years away, a black hole deathmatch is ripping up spacetime, exposing some fascinating dynamics at the heart of a powerful quasar. The quasar, which lives in the core of the galaxy Markarian 231 (Mrk 231), is the closest quasar to Earth and after studying years of data from the Hubble Space Telescope, a team of astronomers have realized that this particular quasar is driven by 2 black holes trapped in an orbital spiral of death. This discovery could be critical to the study of quasars, the super-bright emissions blasting from galaxies in the distant universe. But the fact we have a quasar that’s comparatively close to our galactic neighborhood, Mrk 231 is a great laboratory to gain an insight to these enigmatic objects. When studying the ultraviolet emissions blasting from the quasar’s accretion disk — a disk of superheated gases surrounding the central region — a deeply fascinating discovery was made. The quasar appears to be hollowed out, resembling a ring doughnut, and using dynamical models the researchers quickly realized that there must be two supermassive black holes, one more massive than the other, carving out the center. As they orbit one another inside the quasar’s core, the smaller black hole carves out a region at the inner edge, also creating its own, smaller accretion disk. Calculations show that the pair complete one orbit every 1.2 years. The larger black hole is approximately 150 million times the mass of our sun and its smaller partner is 4 million times the mass of our sun. “We are extremely excited about this finding because it not only shows the existence of a close binary black hole in Mrk 231, but also paves a new way to systematically search binary black holes via the nature of their ultraviolet light emission,” said Youjun Lu, of the National Astronomical Observatories of China, Chinese Academy of Sciences. As the two black holes whip around one another, energy is lost through the emission of gravitational waves. And this means that they are slowly spiraling into one another, set to collide and merge in a few hundred thousand years. The fact there are 2 supermassive black holes occupying the quasar speaks to Mrk 231′s violent past. Known as a “starburst” galaxy, it is a powerhouse of star formation, birthing stars 100 times the rate of our Milky Way. The tidal disruption of a smaller galaxy merging with Mrk 231 is also highlighted by long tails of young, blue stars. The galaxy is also asymmetrical in shape, showing that the billions of stars are still in the process of settling. It’s likely that the smaller black hole in the galactic core was the central black hole occupying the smaller, merging galaxy. The tidal upheaval has also generated huge quantities of in-falling gas, fueling the powerful black hole “engine” and bright quasar. This research is published in the Astrophysical Journal and can be found on the arXiv preprint service. Well, there’s no way this could go wrong. According to recent announcements, a small biotech startup in California has successfully added new synthetic components to the genetic alphabet of DNA, potentially creating entirely new kinds of life on Earth. You’d need a Ph.D. or three to really get into it, but here goes: DNA, the organic molecule that carries genetic information for life, is made from a limited chemical “alphabet.” DNA can be thought of as a molecular code containing exactly four nitrogen-containing nucleobases — cytosine (C), guanine (G), adenine (A), or thymine (T). All known living organisms on the planet, from bacteria to biologists, are based on combinations of this four-letter molecular code: C-G-A-T.
That’s how it’s been for several billion years, but last year the biotech company Synthorx announced development of a synthetic pair of nucleobases — abbreviated X-Y — to create a new and expanded genetic code. The additions to the four letter DNA code effectively raises the number of possible amino acids an organism could use to build proteins from 20 to 172. That opens up entire new vistas of possibilities, including a completely new class of semi-synthetic life forms using a six-letter DNA code instead of a four-letter code. The company insists that multiple safeguards are built into the technology, and that organisms created with the synthetic elements can only be produced in the lab. That, of course, is the premise of roughly one million science fiction horror stories, but what can you do? Well, you can read more about it here. A group of delicately balanced rocks have been standing for thousands of years close to the active San Andreas and San Jacinto faults. A mysterious group of balanced rocks that ought to have been knocked flat centuries ago may have let slip a deep, dark secret about the San Andreas Fault, according to a new study. For two decades a handful of researchers have been uncovering the power of centuries-old earthquakes by studying how easily it would be to tip the balanced rocks that dot the countryside: If precariously balanced rocks have stood for centuries, then the risk or frequency of large quakes is probably low in that area. But if only very sturdy balanced rocks can be found, then it could be that more frequent strong quakes knocked down everything else. “So it’s indirect evidence of what has not happened,” explained Lisa Grant Ludwig, the lead author of a paper about the balanced rocks in the latest issue of the journal Seismological Research Letters. And that’s important for drawing up good earthquake hazard maps and establishing adequate building codes. Then a few years ago researchers found a group of balanced rocks that seem to defy common sense, located in the San Bernadino Mountains, northeast of Los Angeles. These rocks are far too close to the large San Jacinto Fault, right where it edges near the even more notorious San Andreas Fault. One possibility is that the balanced rocks are much younger than they appear and so they have not been around long enough to experience a less frequent, but strong earthquake. Maybe they are even younger than the great earthquakes of 1812 and 1857, the former of which famously toppled the big church, which still lies in ruins, at San Juan Capistrano. To find out, the rocks were dated using cosmogenic dating techniques. These allow researchers to determine how long a rock surface has been exposed to the sky. That showed the rocks were in place for up to 18,000 years — plenty of time to have experienced lots of San Andreas and San Jacinto quakes. Scientists took a long, hard look at 100-mile wide Holden Crater before deciding to send the Curiosity rover to Gale Crater instead for a mission to assess if Mars ever had all the ingredients necessary for life. That goal was met less than seven months after the rover’s Aug. 3, 2012, touchdown. Climate change caused by greenhouse gas emissions will alter the way that Americans heat and cool their homes. By the end of this century, the number of days each year that heating and air conditioning are used will decrease in the Northern states, as winters get warmer, and increase in Southern states, as summers get hotter, according to a new study from a high school student, Yana Petri, working with Carnegie’s Ken Caldeira. It is published by Scientific Reports. Technology to drain heat-trapping CO2 from the atmosphere may slow global warming, but will not reverse climate damage to the ocean on any meaningful timescale, according to research published Monday. A new NASA study has revealed that the ocean abyss has not warmed in the past few years. What does this mean for global warming? At the same time, a second study reported, even the most aggressive timetable for reducing greenhouse-gas emissions will need a big boost from largely untested carbon removal schemes to cap warming to two degrees Celsius (3.6 degrees Fahrenheit) above pre-industrial levels. Above that threshold, say scientists, the risk of climate calamity rises sharply. Earth is currently on a 4 Celsius (7.2 Fahrenheit) trajectory. Planetary-scale technical fixes — sometimes called geo-engineering — have often been invoked as a fallback solution in the fight against climate change. But up to now, little was known about the long-term potential for these measures for restoring oceans, rendered overly acidic after two centuries of absorbing CO2. Scientists led by Sabine Mathesius of the GEOMAR Helmholtz Center for Ocean Research in Kiel, Germany, used computer models to test different carbon-reduction scenarios, looking in each case at the impact on acidity, water temperatures and oxygen levels. If humanity waited a century before sucking massive amounts of CO2 out of the atmosphere, they concluded, it would still take centuries, maybe even a thousand years, before the ocean would catch up. In the meantime, they researchers say, corals will have disappeared, many marine species will have gone extinct and the ocean would be rife with dead spots. “We show that in a business-as-usual scenario, even massive deployment of CO2 removal schemes cannot reverse the substantial impacts on the marine environment — at least not within many centuries,” Mathesius said. Even in a scenario in which large-scale carbon removal begins in 2050 — assuming such technology is available — the ocean does not fare well. “Immediate and ambitious action to reduce CO2 emissions is the most reliable strategy for avoiding dangerous climate change, ocean acidification, and large-scale threats to marine ecosystems,” the researchers concluded. “The threat of ocean acidification alone justifies dramatic and rapid reduction of CO2 emissions,” said Nick Riley, a research associate at the British Geological Survey (BGS). The second study, led by Thomas Gasser of the Institut Pierre-Simon Laplace, near Paris, uses state-of-the-art models to measure the trade-off between reducing emissions and carbon-removing technologies. They show that even if nations strike a deal in Paris adhering to the most aggressive CO2-slashing pathway outlined by UN scientists, it may not be enough to keep Earth on a 2 C trajectory. To have a chance of meeting the 2 C target, 0.5 to 3.0 gigatonnes of carbon — up to a third of total annual CO2 emissions today from industry — would need to be extracted every year starting more or less immediately, they calculate. It’s sort of a variation on the old “If a tree falls in a forest…” quandary. 80 percent of volcanic eruptions on Earth probably go unnoticed by people, because they take place in the planet’s oceans, often at depths of thousands of feet. There’s nobody down there to flee in terror or to write an eloquent account of nature’s fury, as Pliny the Younger did when Vesuvius erupted back in 79 AD. Or rather, undersea eruptions used to go unnoticed. University of Washington researchers have installed an array of cutting-edge monitoring instruments in the vicinity of the Axial Seamount, an underwater volcanic mountain that’s about 300 miles off the coast of the Pacific and a mile beneath the ocean surface. In late April, that gadgetry enabled them to anticipate and then observe a eruption in real time, and to collect a massive amount of data on the event. “It was an astonishing experience to see the changes taking place 300 miles away with no one anywhere nearby, and the data flowed back to land at the speed of light through the fiber-optic cable connected to Pacific City — and from there, to here on campus by the Internet, in milliseconds,” noted UW oceanography professor John Delaney in a press release. The researchers, who are working in a larger effort sponsored by the National Science Foundation, got their first inkling that Axial was about to blow just before midnight on April 23, when eight seismometers installed at the site transmitted warnings that seismic activity in that area was going off the charts. The rate of tremors increased dramatically over the next 12 hours, to a rate of thousands per day. Meanwhile, the center of Axial’s volcanic crater dropped by about 6 feet. Axial Seamount’s latest eruption actually was predicted in advance by Oregon State University researcher Bill Chadwick and his colleague Scott Nooner at the University of North Carolina at Wilmington. It previously erupted in 1998 and 2011, when scientists captured a picture of a bizarre layer of undersea glass formed when molten lava from the volcano encountered the near-freezing seawater. An unexpected leak of a chemical designed to tag complex organic molecules in samples collected by NASA’s Mars rover Curiosity appears to have serendipitously done its job, scientists reported on Tuesday. Curiosity’s onboard laboratory includes seven so-called “wet chemistry” experiments designed to preserve and identify suspect carbon-containing components in samples drilled out from rocks. 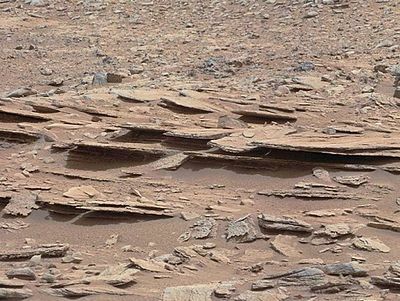 Curiosity landed in a 96-mile wide impact basin known as Gale Crater in August 2012 to determine if the planet most like Earth in the solar system has or ever had the chemistry and environments to support microbial life. NASA’s Curiosity rover landed in the Martian crater known as Gale Crater, which is approximately the size of Connecticut and Rhode Island combined. This oblique view of Gale, and Mount Sharp in the center, is derived from a combination of elevation and imaging data from three Mars orbiters. The view is looking toward the southeast. Mount Sharp rises about 3.4 miles (5.5 kilometers) above the floor of Gale Crater. Scientists quickly fulfilled the primary goal of the mission, discovering sulfur, nitrogen, hydrogen, oxygen, phosphorus and carbon in powder Curiosity drilled out of an ancient mudstone in an area known as Yellowknife Bay. That paved the way for a more ambitious hunt for complex organic molecules, an effort complicated by the MTBSTFA leak. “This caused us a lot of headache in the beginning, frankly, because it has a lot of carbon in it and other (chemical) fragments that can break apart,” Curiosity scientist Danny Glavin, with NASA’s Goddard Space Flight Center in Greenbelt, Maryland, said on Tuesday (March 17) at the Lunar and Planetary Science conference in Houston, Texas. “We’ve turned this sort of bad thing into a good thing because we’ve learned how to work around this leak. We’ve actually used this vapor from this leak to carry out derivitization,” he said, referring to the technique to tag organics. Possible image of Gliese 581d, a controversial exoplanet that may exist only 20 light-years from Earth. Despite having discovered nearly 2,000 alien worlds beyond our solar system, the profound search for exoplanets — a quest focused on finding a true Earth analog — is still in its infancy. It is therefore not surprising that some exoplanet discoveries aren’t discoveries at all; they are in fact just noise in astronomical data sets. But when disproving the existence of extrasolar planets that have some characteristics similar to Earth, we need to take more care during the analyses of these data, argue astronomers from Queen Mary, University of London and the University of Hertfordshire. In a paper published by the journal Science last week, the researchers focus on the first exoplanet discovered to orbit a nearby star within its habitable zone. Revealed in 2009, Gliese 581d hit the headlines as a “super-Earth” that had the potential to support liquid water on its possibly rocky surface. With a mass of around 7 times that of Earth, Gliese 581d would be twice as big with a surface gravity around twice that of Earth. Though extreme, it’s not such a stretch of the imagination that such a world, if it is proven to possess an atmosphere and liquid ocean, that life could take hold. And the hunt for life-giving alien worlds is, of course, the central motivation for exoplanetary studies. But the exoplanet signal has been called into doubt. Gliese 581d’s star, Gliese 581, is a small red dwarf around 20 light-years away. Red dwarfs are known to be tempestuous little stars, often generating violent flaring outbursts and peppered in dark features called starspots. To detect the exoplanet, astronomers measured the very slight frequency shift (Doppler shift) of light from the star — as the world orbits, it exerts a tiny gravitational “tug”, causing the star to wobble. When this periodic wobble is detected, through an astronomical technique known as the “radial velocity method,” a planet may be revealed. Last year, however, in a publication headed by astronomers at The Pennsylvania State University, astronomers pointed to the star’s activity as an interfering factor that may have imitated the signal from an orbiting planet when in fact, it was just noisy data. The upshot is that this new paper challenges the statistical technique used in 2014 to account for the signal being stellar noise — focusing around the presence of starspots in Gliese 581′s photosphere. Gliese 581d isn’t the only possible exoplanet that exists around that star — controversy has also been created by another, potentially habitable exoplanet called Gliese 581g. Also originally detected through the wobble of the star, this 3-4 Earth mass world was found to also be in orbit within the habitable zone. But its existence has been the focus of several studies supporting and discounting its presence. Gliese 581 is also home to 3 other confirmed exoplanets, Gliese 581e, b and c.
Currently, observational data suggests Gliese 581g was just noise, but as the continuing debate about Gliese 581d is proving, this is one controversy that will likely keep on rumbling in the scientific journals for some time.